Well done to everyone for making such a fantastic effort with their Book Week costumes; they were fantastically frightening and marvellously monstrous! 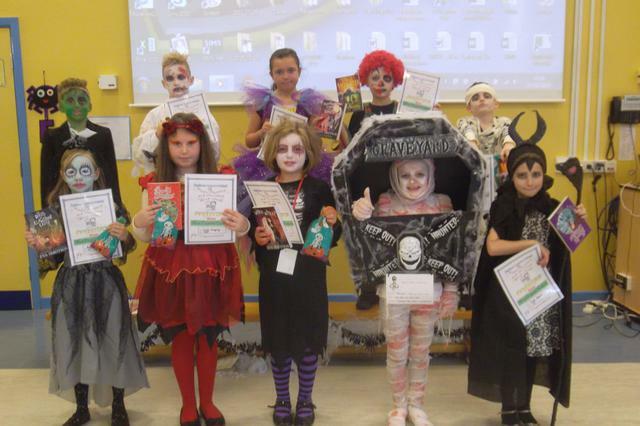 Congratulations to those children who were chosen as winners in their class for their exceptional costumes and who each received a book prize. We have had a great week this week celebrating books and reading for pleasure. Each class has spent the week enjoying literacy, art and cross curricular activities all based around a book on the theme of Heroes, Heroines and Villains. A very, very big thankyou to the Burnley Branch of Sainsbury's who provided every child with sweets to eat on World Book Day and also to Tesco for their donation of biscuits and drinks for all the children. Children and Staff looked fantastic in their costumes on World Book Day. It was really hard to choose two winners from each class but here they are. Each child received a book and certificate as a reward. A big thankyou to all those who supported our Book Fair in school this week. It's been a great success. This year's theme for Book Week is Heroes, Heroines and Villains. On March 7th, World Book Day, children will be invited to dress up as characters from this theme. They could dress up as Superheroes, heroes and heroines from history, sporting heroes, real life heroes and heroines such as firefighters, soldiers, Horrid Henry..the list is endless..
More information will be given out nearer the time. Everyone looked fantastic in their costumes this week. Well done to everyone, particularly the 2 winners in each class. Each child received a prize of a book and some scary chocolate. World Book Day congratulations to all the children for the effort they put into their costumes. They all looked fantastic. Here are pictures from the day. Children's Book Week will take place on Monday 27th February to Friday 2nd March. Children in each class will take place in a variety of literacy and cross curricular activities based around a story. On Thursday 1st March, we are asking all children in school to dress up to celebrate World Book Day. Children can come dressed as a character from any story - Harry Potter, Matilda, Alice, Willy Wonka, The Mad Hatter....the list is endless! The most original outfit in each class will win a book prize. Children do not necessarily have to buy an outfit as homemade outfits are usually the most innovative! The class teachers will talk to the children in their class and give them ideas for dressing up.